Two Moons is officially mine. Post away and let me know how I can help. I will take photo's of work and plans. 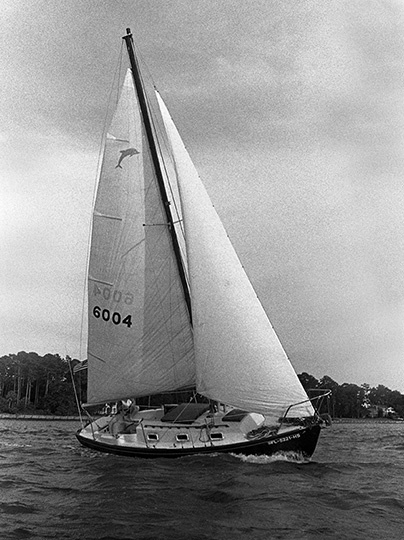 Bill - Happy new owner of Pacific Dolphin #250. October 18, 2009. 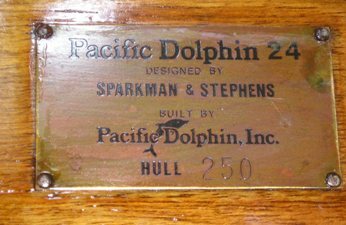 Peter Edwards checked in Two Moons, Pacific Dolphin #250, with following email (minor edit) and pictures. A search of our electronic files failed to turn up Pete's earlier check in and we await further info. I wrote sometime ago about owning a Dolphin 24. Well, we are about to bring her back to life in the next year. Our kids are of age and it's time to take them sailing. The hull number is #250. This is the plate that was on the bulkhead. I will look around for info on the boat as we start to bring her back to life. Glad to see that other owners are out there. November 21, 2009. We got the following email and picture from Peter. Here is a little bit about our Dolphin 24. Her name is Two Moons. Previous name was Chivalry. 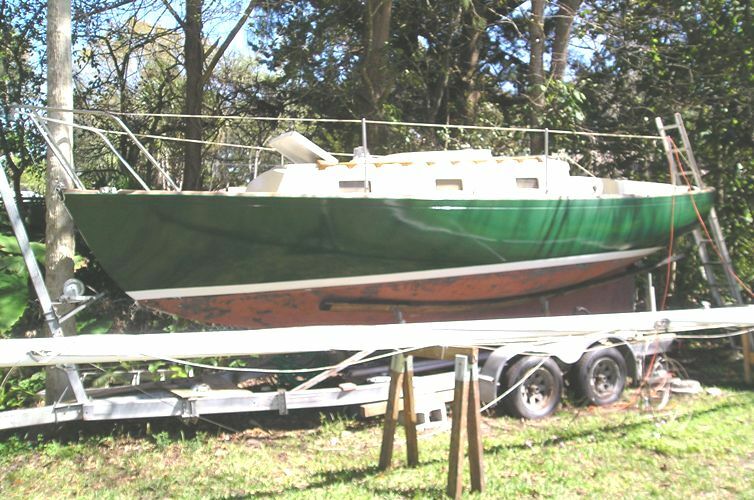 The boat is in Holly Hill, Florida - that is in the greater Daytona Beach area. The boat was located in somewhere in California, Not sure where. The owner was in the military when he went over seas he had the boat trailored to his dad’s house here in town. It sat for eight years. I came across her in real bad shape, I launched her in October 1991 (there were two full moons that month hence the name.) 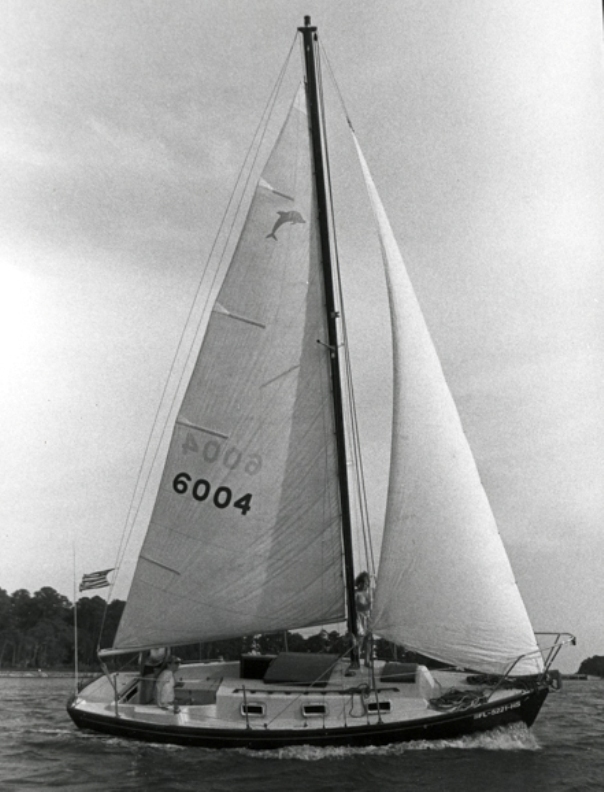 From 1991 to 1999 we sailed from Daytona Beach to Savannah GA. But mainly, we stayed in the Daytona Beach area. In 2000, we pulled the boat out of the water and she has been in the backyard ever since. Now that the kids are older we are working on her once again. We plan to launch her next year, 2010. But that kind of depends on the economy. Glad you have this site. Its good to see others out there. I've attached a picture of us sailing in Savannah. Got this one on March 17, 2014 - Great picture! Webmaster Note: Two Moons has plenty of company. Many of these boats patiently wait years while their owners work out temporarily higher priorities. As example, Passage, # 10, was bought 10 years ago with an ambitious plan to restore her - she still sits in the barn, a year's worth of work remaining. Chandra, # 74 has been in garage for 10 years, waiting. They are worth the wait. January 17, 2011. Peter sent in the following update on Two Moons (minor edits). Two Moons is coming together, slowly. Every weekend we are doing one small something. This past weekend my son and I removed the lifeline stanchions so we can reseal under them. It's small stuff but we are heading in the right direction. Our plans are to put her in the water this summer. Our next big projects are bulk heads, and the cabin floor, and many other things that never seem to end. Two Moons is still in the yard waiting to be put back in the water. I have decided to for go making her look pretty and just get her back in the water in the next few months. I will let you know more as we get closer to the day we place her back in the water.